Mucocele of the cystic duct remnant is an uncommon hepatobiliary complication of a liver transplant. Current practice usually involves either excising the cystic duct, or incorporating the distal end of the transected cystic duct into the suture line of the biliary anastomosis to ensure drainage. We report a patient who developed cystic duct remnant mucocele after the latter approach was adopted. We believe that this is likely related to delayed anastomotic stricturing, which prevented draining from the remnant cystic duct. We also discuss the incidence, pathology, investigations, and treatment of this condition. A 55-year-old lady underwent an orthotopic liver transplant in January 2009 for stage III primary biliary cirrhosis (Mayo score, 8.9). She had a side-to-side cavaplasty, standard arterial, and duct-to-duct biliary anastomosis using interrupted sutures with 5-0 Prolene and polydioxanone. The donor cystic duct had a low insertion into the common bile duct, and the distal end was incorporated into the suture line to allow for drainage. Seven days after the orthotopic liver transplant, she had an acute cellular rejection, which we treated successfully with intravenous methylprednisolone. Her immuno­suppression regimen was maintained with azathioprine and tacrolimus. She remained well, having normal liver function test results for 5 months after the transplant. Subsequently, her alkaline phosphatase levels increased steadily from 1.5 µkat/L (90 U/L) (range, 0.5-2 µkat/L; 35-120 U/L) 5 months after the transplant to 3.33 µkat/L (200 U/L ) 4 months later. During this time, she complained of intermittent chills (clinically consistent with episodes of cholangitis). The results of an ultrasound scan of her abdomen showed a dilated common bile duct measuring 14 mm at the porta hepatis with prominent intrahepatic biliary radicles. The results of a Doppler examination of the hepatic artery and portal veins were normal. 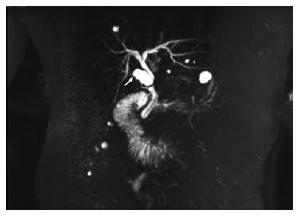 Magnetic resonance cholangiography (Figure 1) revealed a 2.5 ± 1.3 cm collection in the porta hepatis compressing the common bile duct and the distal common hepatic duct. The fluid collection was communicating with the long, low, inserting cystic duct remnant. There was mild biliary dilatation proximal to the cystic collection. The results of her liver function tests at the time were bilirubin, 16 µmol/L (range, 0-19 µmol/L); alanine transaminase, 0.47 µkat/L (28 U/L) (range, 0-0.58 µkat/L; 0-40 U/L); and alkaline phosphatase, 3.78 µkat/L (227 U/L). The results of an endoscopic ultrasound examination showed that the cystic duct remnant and the common bile duct ran parallel to each other, and the cystic dilatation was contiguous with the biliary tree. No intraductal contents were noted on endoscopic ultrasound. After review of the image, a mucocele of the cystic duct remnant was diagnosed, and this was causing extrinsic compression of the biliary tree. 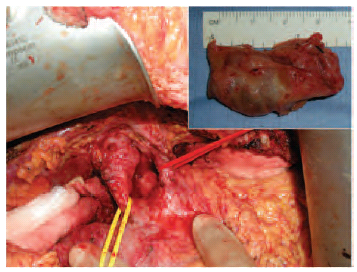 This was managed surgically (Figure 2) with mucocele excision and Roux-en-Y hepaticojejunostomy. The patient was discharged home 14 days later with no complications. Orthotopic liver transplant is an accepted therapy for patients with end-stage liver disease.1 Technical complications remain a significant cause of morbidity and mortality.2 Biliary complications account for approximately 13% to 19% of the morbidities.3 Anastomotic biliary strictures and bile leaks account for most of these. The diagnosis of cystic duct mucocele in the appropriate setting is usually made by radiologic modalities. Demonstration of fluid collection at the porta hepatis is a nonspecific finding. However, a combination of a well-defined, round, fluid collection adjacent to the common hepatic duct, in conjunction with a cholangiographic demonstration of an extrinsic mass compressing the common hepatic duct, would confirm evidence of a mucocele.7 Magnetic resonance cholangiopancreatography is now the imaging modality of choice for diagnosing a cystic duct mucocele. It is critical that one excludes hepatic artery pseudoaneurysms in all such fluid collections with Doppler studies.10 Treatment of this condition is operative-mucocele excision and reconstruction of the biliary tree with a Roux-en-Y hepaticojejunostomy. A cystic duct mucocele is an uncommon but preventable complication of orthotopic liver transplant. A cystic duct mucocele can be prevented by excising the remnant of the cystic duct in a liver allograft. Although, incorporating the distal open end of the cystic duct remnant into the biliary anastomosis is a recommended operative technique,9 to prevent future mucocele formation, we feel (as demonstrated in our patient) that delayed stricture formation at the anastomosis still may result in occlusion of cystic duct stump drainage and subsequent mucocele formation. National Institute of Health consensus development conference statement, Liver transplantation, June 20-23, 1983. Hepatology 1983;3:(Suppl)107S-110S. Wood RP, Shaw BW Jr, Starzl TE. Extrahepatic complications of liver transplantation. Semin Liver Dis. 1985;5(4):377-384. Ringe B, Oldhafer K, Bunzendahl H, Bechstein WO, Kotzerke J, Pichlmayr R. Analysis of biliary complications following orthotopic liver transplantation. Transplant Proc. 1989;21(1 Pt 2):2472-2476. Caputo M, Spagnol A, Minguzzi MT, et al. Incidence of dilatation of residual cystic duct in liver transplantation. Our experience with 152 cases [in Italian]. Radiol Med. 1995;89(5):647-650. Caputo M, Piolanti M, Riccioli LA, et al. Nonobstructive residual mucocele of the cystic duct. Reassessment of complications in our 13 years' experience with liver transplantation [in Italian]. Radiol Med. 2000;100(5):354-356. Liang TB, Zhao ZC, Jia CK, Zheng SS. Mucocele formation of cystic bile duct remnant after orthotopic liver transplantation. Chin Med J (Engl). 2007;120(3):254-256. Zajko AB, Bennett MJ, Campbell WL, Koneru B. Mucocele of the cystic duct remnant in eight liver transplant recipients: findings at cholangiography, CT, and US. Radiology. 1990;177(3):691-693. Kune GA. The influence of structure and function in the surgery of the biliary tract. Ann R Coll Surg Engl. 1970;47(2):78-91. Koneru B, Zajko AB, Sher L, et al. Obstructing mucocele of the cystic duct after transplantation of the liver. Surg Gynecol Obstet. 1989;168(5):394-396. Tobben PJ, Zajko AB, Sumkin JH, et al. Pseudoaneurysms complicating organ transplantation: roles of CT, duplex sonography, and angiography. Radiology. 1988;169(1):65-70. Figure 1. Magnetic resonance cholangiogram showing mucocele of the cystic duct (arrow) compressing the common bile duct. Figure 2. Intraoperative picture demonstrating the mucocele (yellow sling). Inset shows mucocele after excision.